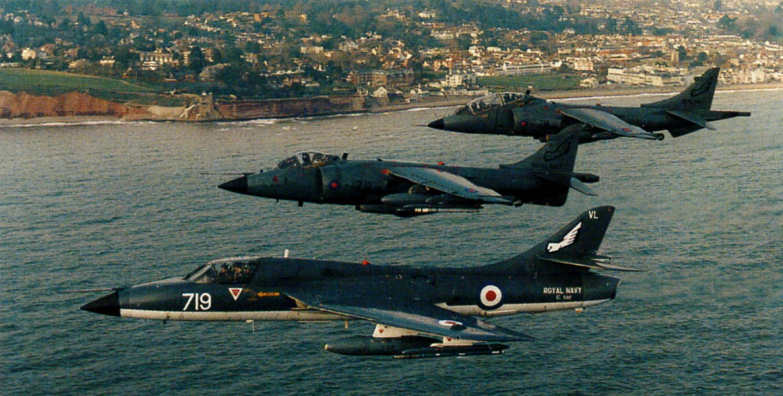 Hawker Siddeley Harrier Mk 52 G-VTOL was originally painted in a patriotic red, white and blue scheme designed by HSA Deputy Chief Engineer John Fozard. 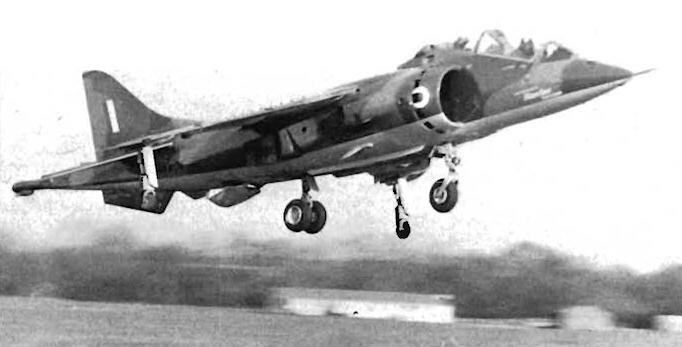 It remained in this scheme only a matter of weeks, however, the Harrier running off the runway at Dunsfold just three weeks after its fi rst flight, which had been made on September 16, 1971. 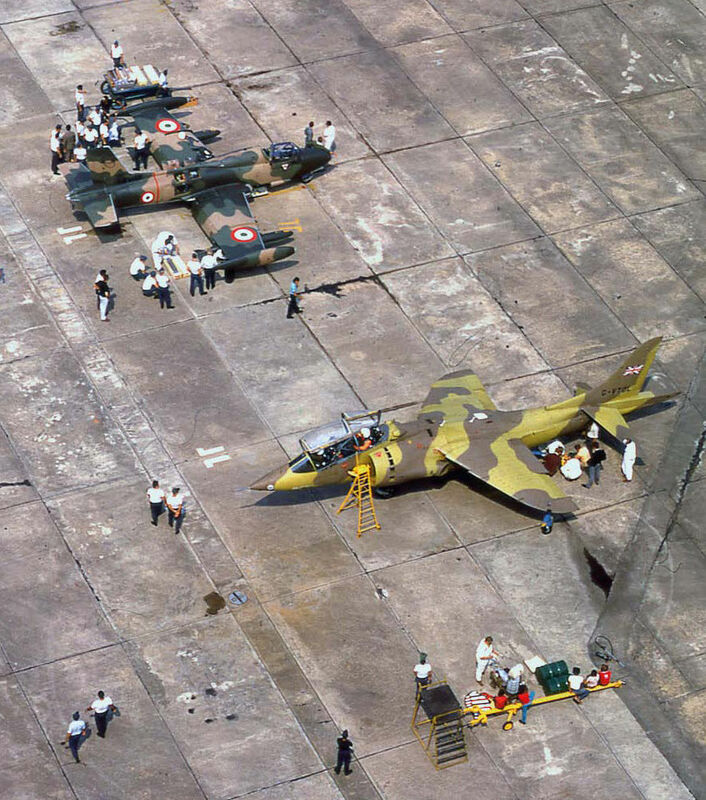 By the time G-VTOL was ready to fly again in May 1972 it had been painted in a two-tone desert camouflage scheme with pale blue undersurfaces, which was more suitable for the upcoming sales tour of India and the Middle East. The “Navy” legend in white on the fin was added for ship trials aboard HMS Fearless at Greenwich in June 1975. 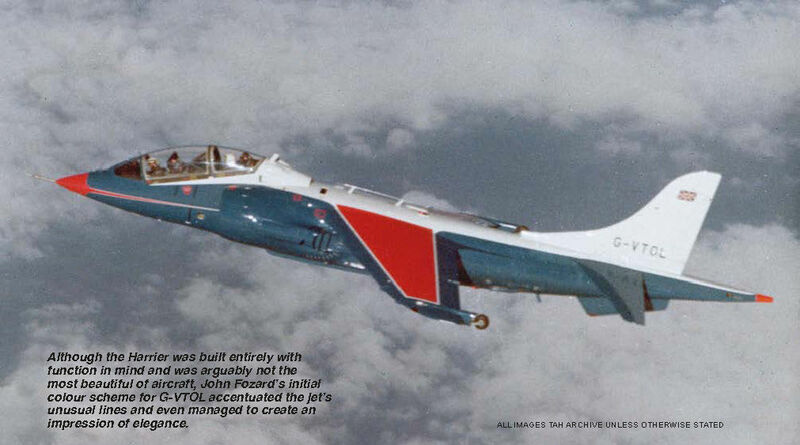 In 1979 G-VTOL underwent another change in markings, being painted in a grey and white semi-naval scheme which matched that of its demonstrator stablemate BAe Hawk ZA101/G-HAWK. 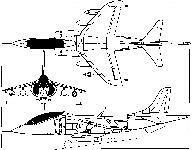 When G-VTOL was selected for trials with the Skyhook system in 1985, the Skyhook legend and badge were applied to the forward fuselage and fin respectively. На модернизированных СВВП Harrier T.Mk 4A носовые части фюзеляжа были выполнены, как у GR.Mk 3, с лазерным дальномером-целеуказателем. Изображен самолет с маркировкой 20-й эскадрильи, перевооруженной на Harrier к 1 декабря 1970 года. 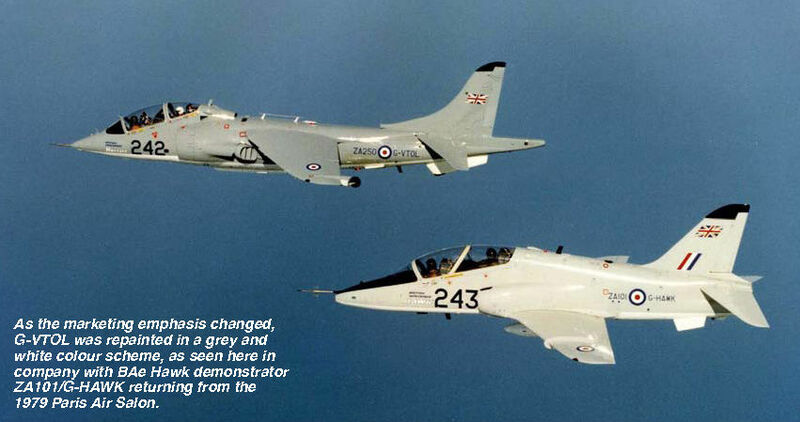 Although the Harrier was built entirely with function in mind and was arguably not the most beautiful of aircraft, John Fozard’s initial colour scheme for G-VTOL accentuated the jet’s unusual lines and even managed to create an impression of elegance. Hawker Siddeley Harrier Mk 52 demonstrator G-VTOL in the distinctive and stylish - although unfortunately rather short-lived - initial red, white and blue colour scheme designed by John Fozard, hovering at Dunsfold shortly after its first flight in September 1971. 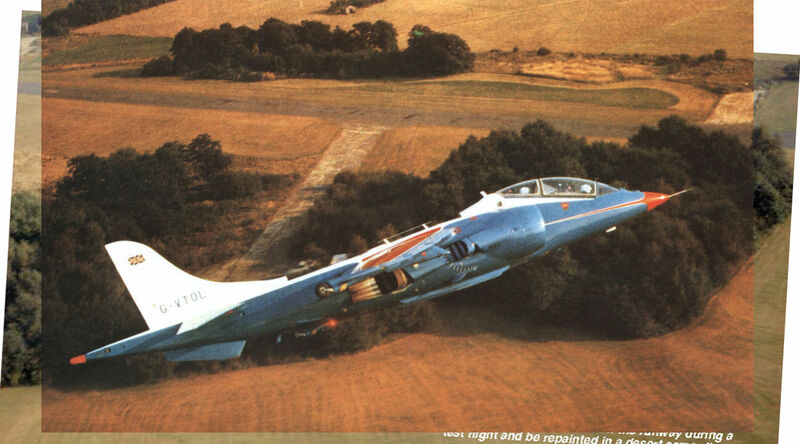 Taken sometime during the three-week period G-VTOL was flown in its first colour scheme, this photograph captures the aircraft making a turn over the western perimeter track at Dunsfold. Within a matter of days it would run off the runway during a test flight and be repainted in a desert camouflage scheme for its upcoming promotional tour. G-VTOL is prepared for another flight at Dunsfold. 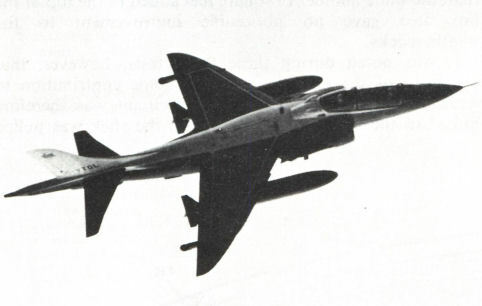 Two-seat Harriers intended for use only in the training role, essentially non-RAF operators, retained the broader-chord fin as seen here, the RAF retrofitting its two-seaters with a smaller fin for better ground-attack performance. The manufacture of G-VTOL depended on the goodwill of numerous firms, including Rolls-Royce, which loaned and provided technical support for a total of six Pegasus 11/Mk 103 engines throughout G-VTOL’s career. 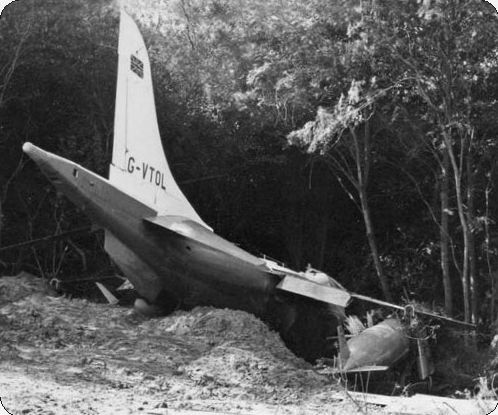 Following its mishap at Dunsfold in October 1971 G-VTOL was repaired and made ready for a sales tour of the Middle East and India, for which it was painted in a new desert camouflage colour scheme with pale blue undersurfaces. It is seen here hovering during tests at Dunsfold before setting off on the first leg of the tour. 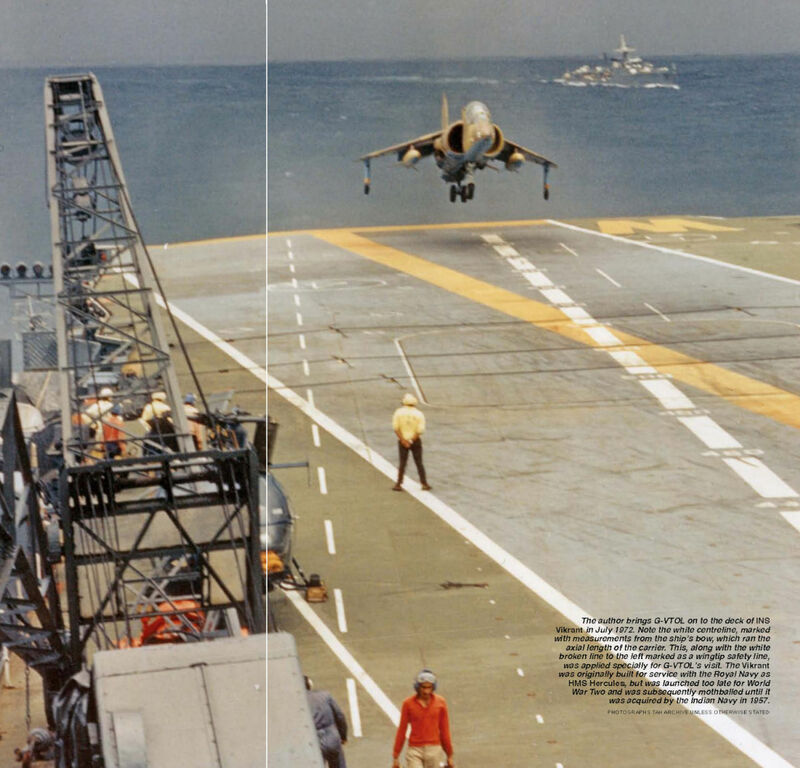 Those who experienced one of the author’s display routines in G-VTOL will be familiar with the “Farley climb”; the Harrier rises straight into a vertical climb while the undercarriage is swiftly retracted. 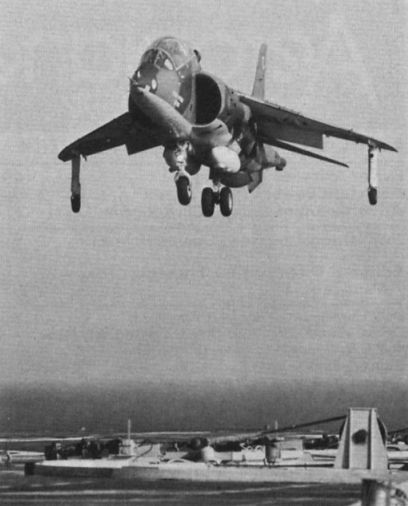 Although the Indian Navy was clearly impressed with the G-VTOL demo in 1972, it would be seven years before India would finally commit to the jump-jet in the form of an order for six Sea Harriers in 1979, the first of which was delivered in 1983. Самолет G-VTOL представлял собой демонстрационный образец, построенный по стандарту Harrier T.Mk 2. На фотографии хорошо виден удлиненный киль, первоначально устанавливаемый на двухместные самолеты Королевских ВВС. 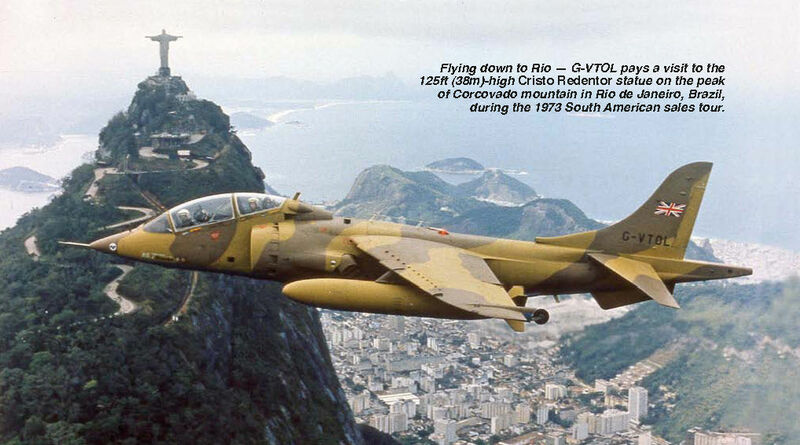 Flying down to Rio - G-VTOL pays a visit to the 125 ft (38 m)-high Cristo Redentor statue on the peak of Corcovado mountain in Rio de Janeiro, Brazil, during the 1973 South American sales tour. The hardworking G-VTOL aboard HMS Hermes during service release trials in February 1977. 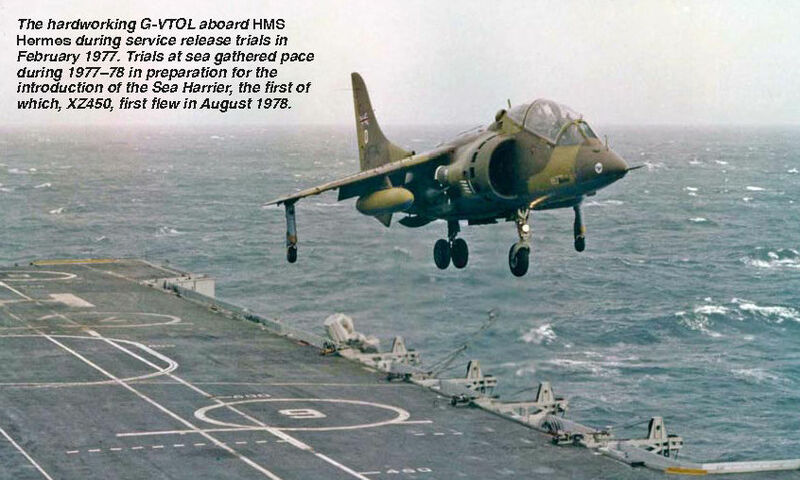 Trials at sea gathered pace during 1977-78 in preparation for the introduction of the Sea Harrier, the first of which, XZ450, first flew in August 1978. 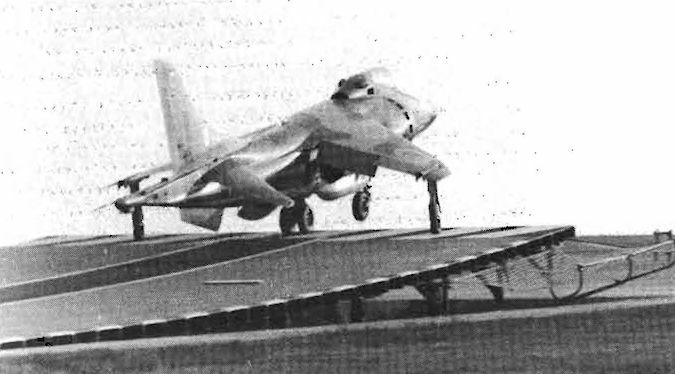 The author brings G-VTOL on to the deck of INS Vikrant in July 1972. Note the white centreline, marked with measurements from the ship’s bow, which ran the axial length of the carrier. This, along with the white broken line to the left marked as a wingtip safety line, was applied specially for G-VTOL’s visit. The Vikrant was originally built for service with the Royal Navy as HMS Hercules, but was launched too late for World War Two and was subsequently mothballed until it was acquired by the Indian Navy in 1957. 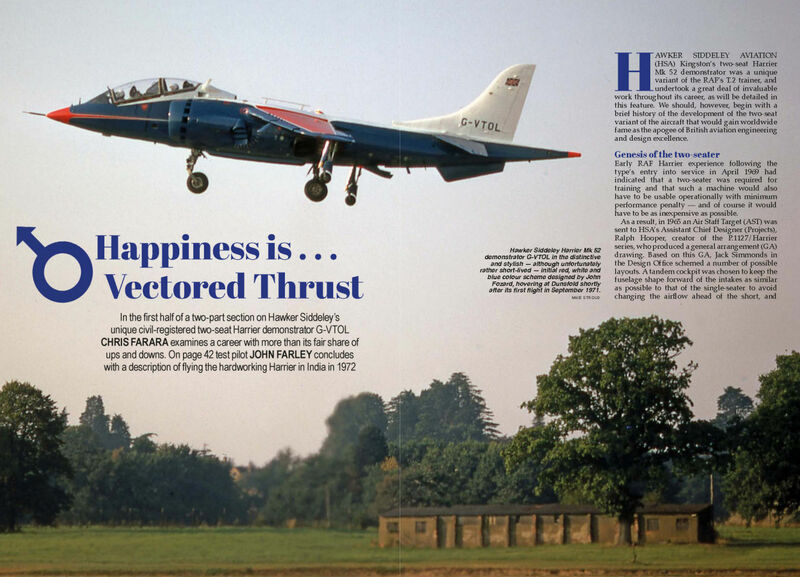 G-VTOL’s visit to the Vikrant marked the first shipborne activity for a two-seat Harrier, the demonstrator being fitted with “the big motor”, the Rolls-Royce Pegasus 11, earlier production two-seaters having been fitted with the lower-thrust Pegasus 6 or 10 engine. 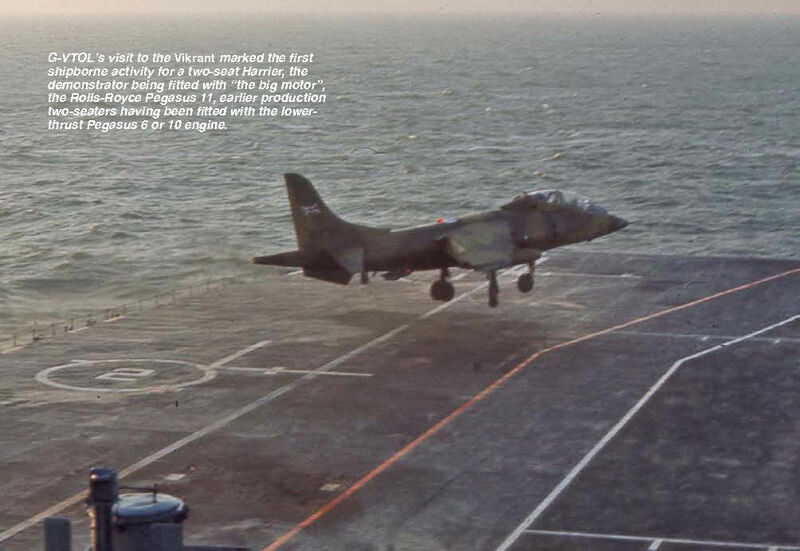 Surprisingly few photographs of G-VTOL aboard the Vikrant appear to have been taken, the aircraft being seen here aboard HMS Hermes during service release trials in 1977. 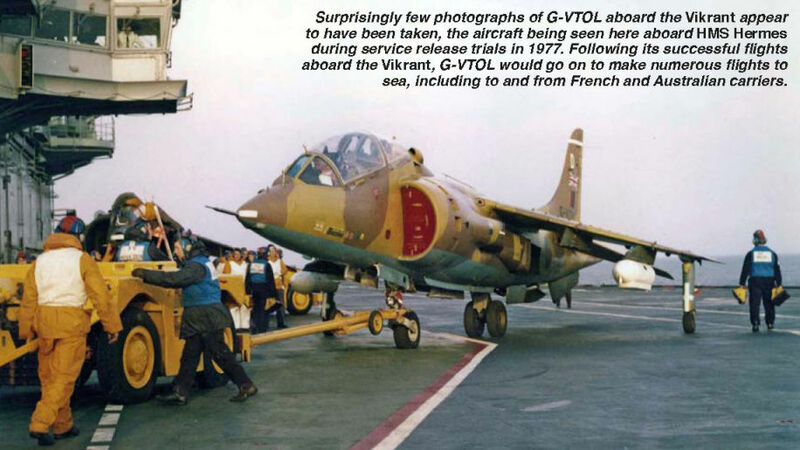 Following its successful flights aboard the Vikrant, G-VTOL would go on to make numerous flights to sea, including to and from French and Australian carriers. 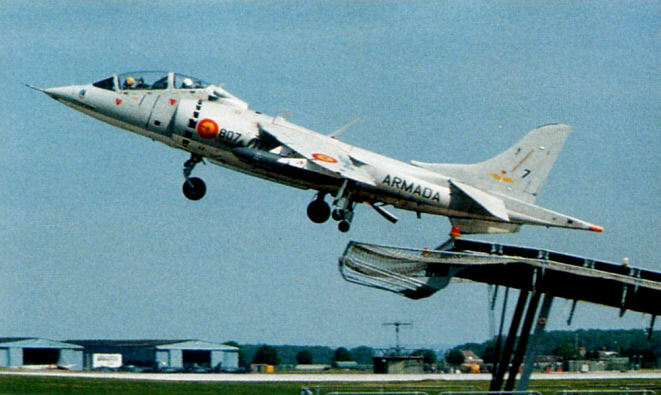 With roundel applied on the aft fuselage, G-VTOL points towards the ski-jump erected at Farnborough by the Royal Engineers. 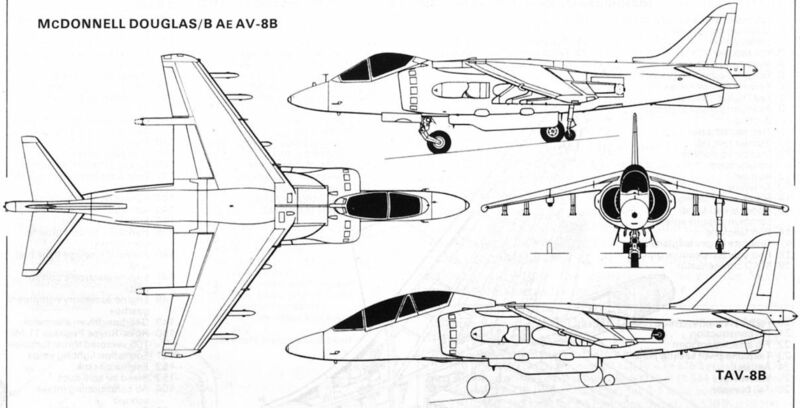 The aircraft would later also have military serial ZA250 applied, to allow the carriage of trials weapons, which was not permitted on civil aircraft. G-VTOL leaps into the air from the variable-angle ski-jump at the Royal Aircraft Establishment at Bedford. 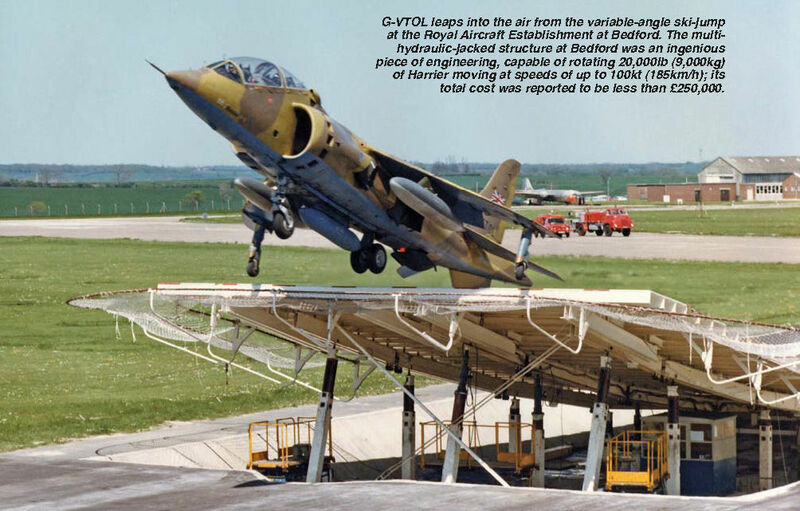 The multi-hydraulic-jacked structure at Bedford was an ingenious piece of engineering, capable of rotating 20,000lb (9,000kg) of Harrier moving at speeds of up to 100kt (185km/h); its total cost was reported to be less than ?250,000. Hawker Siddeley Harrier Mk 52 G-VTOL and Aermacchi MB-326K prototype I-KMAK at Santa Cruz in 1973. As the marketing emphasis changed, G-VTOL was repainted in a grey and white colour scheme, as seen here in company with BAe Hawk demonstrator ZA101/G-HAWK returning from the 1979 Paris Air Salon. 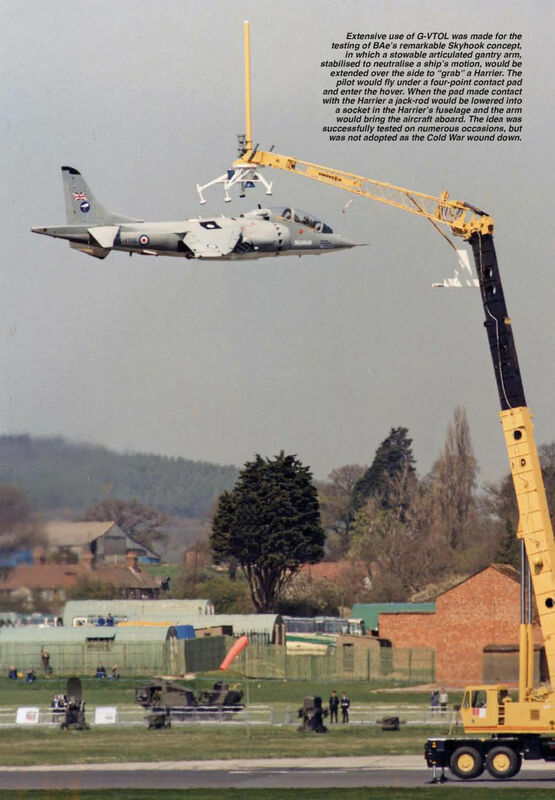 Extensive use of G-VTOL was made for the testing of BAe’s remarkable Skyhook concept, in which a stowable articulated gantry arm, stabilised to neutralise a ship’s motion, would be extended over the side to “grab” a Harrier. The pilot would fly under a four-point contact pad and enter the hover. 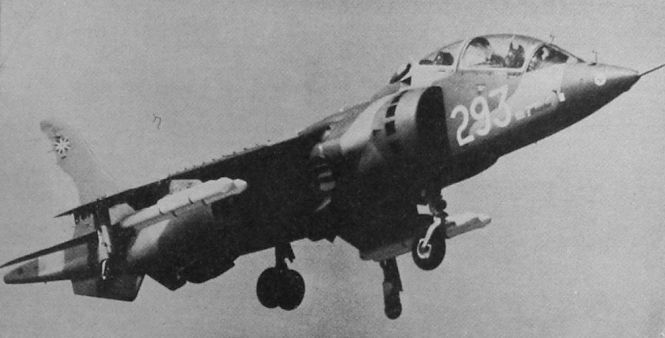 When the pad made contact with the Harrier a jack-rod would be lowered into a socket in the Harrier’s fuselage and the arm would bring the aircraft aboard. The idea was successfully tested on numerous occasions, but was not adopted as the Cold War wound down. Following its retirement in 1986 after a long and productive career, G-VTOL was acquired in 1989 by Brooklands Museum (www.brooklandsmuseum.com), where it is kept in excellent condition and often reunited with old friends, including former test flight observer Mike Craddock, who is a voluntary steward at the museum. Производство Harrier GR.Mk 1/Т.Mk 2. 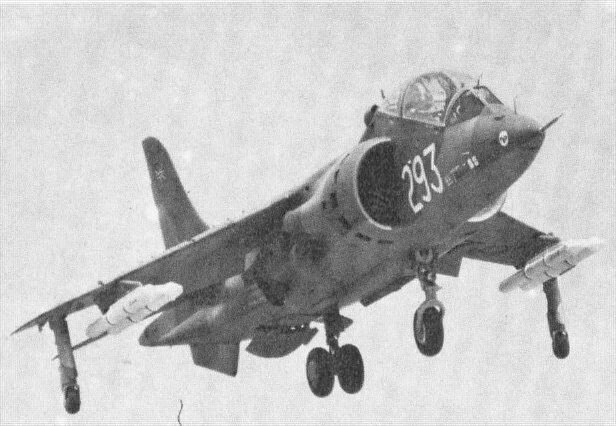 Шесть предсерийных Harrier были заказаны 19 февраля 1965 года. Первые полеты прошли с 31 августа 1966 по 14 июля 1967 года. За ними последовали 78 одноместных и 16 двухместных Harrier. Обозначения с XV738 по XV762 и с XV776 по XV810 получили 60 GR.Mk 1. Их первые полеты прошли с 28 декабря 1967 по 25 марта 1971 года. Следующие 17 самолетов (с XW916 по XW 924 и с XW763 по XW770) поднялись в воздух с 11 июня 1971 по 4 января 1972 года под обозначением GR.Mk 1А. Прототипами самолета T.Mk 2 были XW174 и XW175 (на снимке), их первые полеты прошли 24 апреля и 14 июля 1969 года. В апреле 1968 года было заказано девять машин под обозначением с XW264 по XW272; первые полеты - с 3 октября 1969 по 4 мая 1971 года. Пять самолетов (с XW925 по XW927 и с XW933 по XW934) были построены с 26 августа 1971 года по 16 октября 1973 года. Машина XW926 (6 апреля 1972 года) была первой усовершенствованной до стандарта T.Mk 2А. BAe Harrier ZB605, the first T.8N trainer which made its first flight last July and is now undergoing trials. Двухместные учебные TAV-8A. Как и британские ВВС, авиация КМП потеряла много Harrier в первые годы эксплуатации. Пилотов, привыкших летать на скоростных самолетах, типа F-4 и А-4, требовалось переучивать, как экипажи для более тихоходных машин (например, OV-10, А-6, C-130) и вертолетов. В 1975 году в Черри Пойнт была сформирована эскадрилья VMAT-203, в задачу которой входила подготовка пилотов реактивных СВВП. Основной упор при обучении делался на решение задач непосредственной поддержки войск. Часть получила все восемь TAV-8A, заказанных в 1974 году, а также 10 AV-8A. Потери Harrier резко снизились, как только эскадрилья приступила к тренировкам. Палубные квалификационные испытания двухместных машин проводились в 1976 году на авианосце "Франклин Д. Рузвельт", а также на небольших вертолетоносцах КМП. 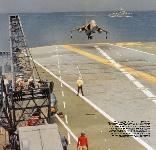 Хотя эскадрилья получила первые Harrier II в конце 1983 года, она продолжала подготовку пилотов AV-8C до марта 1985 года. Параллельно VMAT-203 стала заниматься обучением пилотов AV-8B. Последние TAV-8A были отправлены на базу хранения в конце 1987 года. Двухместные TAV-8A использовались эскадрильей VMAT-203 вплоть до появления учебных вариантов Harrier II. Последние пять TAV-8A были отправлены на базу хранения AM ARC в ноябре 1987 года. Two-seat TAV-8As of specialist Harrier training unit VMAT-203 await their next flight at Cherry Point. Established in 1975, VMAT-203 trained all USMC (and Spanish Navy) AV-8A pilots, the last completing the course in March 1985. The unit continues to train AV-8B pilots and maintenance crews. Wearing the unit’s "KD” tail code, these examples have had toned-down "stars and bars" applied. Индия приобрела четыре двухместных Harrier T.Mk 60 для пополнения своей эскадрильи самолетов FRS.Mk 51. Индийские Sea Harrier вместе с вертолетами Sea King действуют с единственного авианосца этой страны "Вираат" (бывший британский авианосец "Гермес"). В распоряжении испанских ВМС находились всего две спарки, одна из которых изображена на фотографии. Рядом виден двигатель Rolls-Royce Pegasus, устанавливавшийся на ранних Harrier. В мае 1989 года испанские летчики проходили обучение взлету с носового трамплина на авиабазе в Йеовилтоне и лишь затем приступили к полетам с борта "Принца Астурийского". 24 апреля 1969г. : первый двухместный СВВП Harrier T.Mk 2 (код XW174) впервые взлетел в Дансфорде, Серрей, через месяц после подписания министром обороны США заказа на поставку 12 машин Harrier для Корпуса морской пехоты. 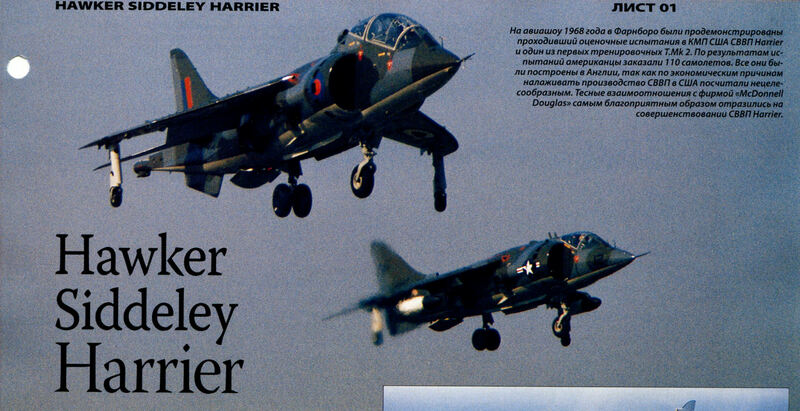 Hawker Siddeley’s two-seat Harrier demonstrator. 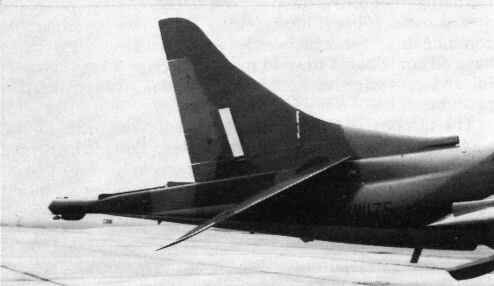 The development Harrier T Mk 2 XW175 with the 23-in (58-cm) extended fin for flight trials. 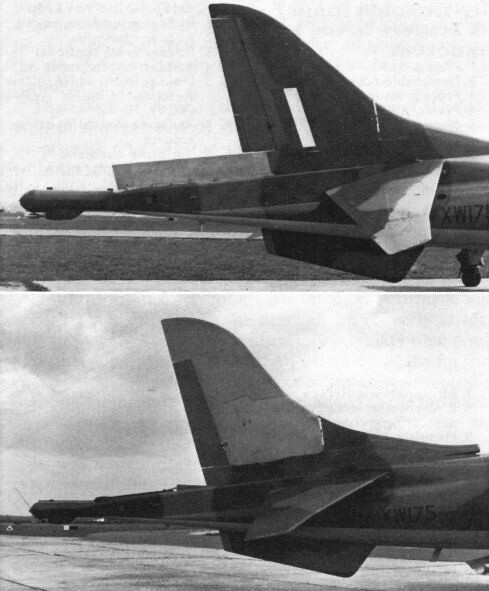 The original version of the 18-in (46-cm) extended fin on the development Harrier T Mk 2 XW175, with the underfin removed for one series of tests. 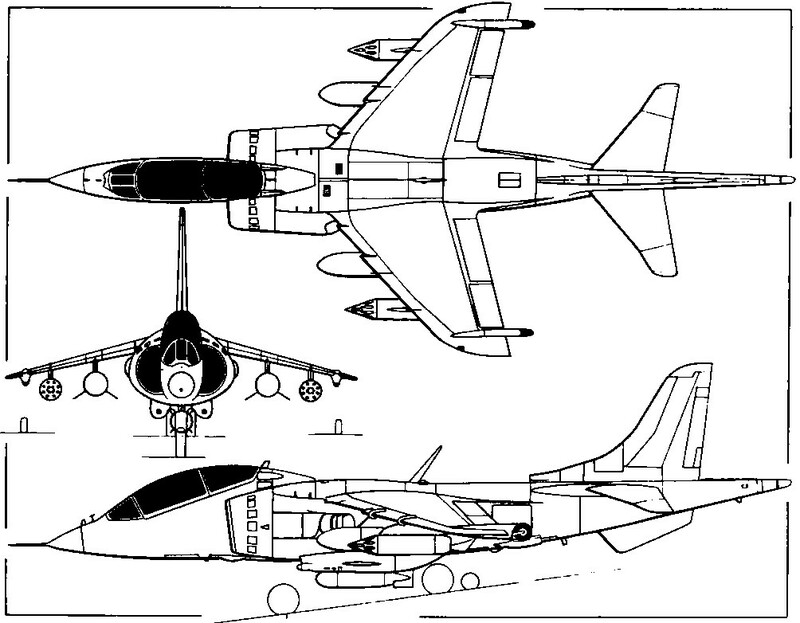 The extended tailcone carries a brake/antispin 'chute and is a standard fit for all development flying but is not carried on Service Harriers. The experimental extension of the fin root with original fin height and (below) the final 18-in (46-cm) fin extension used in development trials. The development two-seater XW175 with the final production 18-in (46-cm) extended fin. S/Ldr. 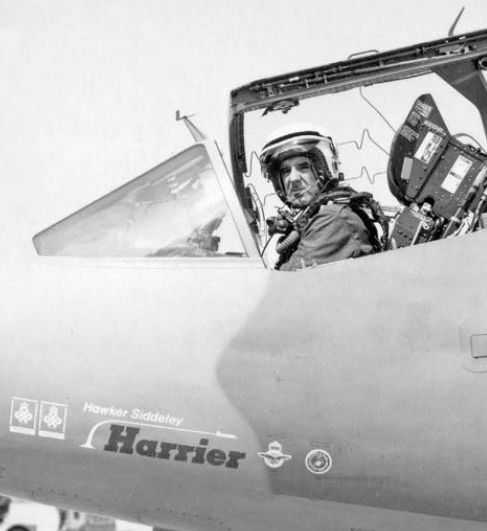 Douglas Marr, with the author in the back seat, taxi-ing out in Harrier T2 XW272 "Z"
Four of the production two-seat Harrier T Mk 2s on the flight line of No 233 OCU at RAF Wittering. The colorful, appropriately-registered Harrier Mk 52 demonstrator. This aircraft in ferry configuration with 27-in (68,5-cm) extended wing tips and two 330-Imp gal (150-l) ferry drop tanks. 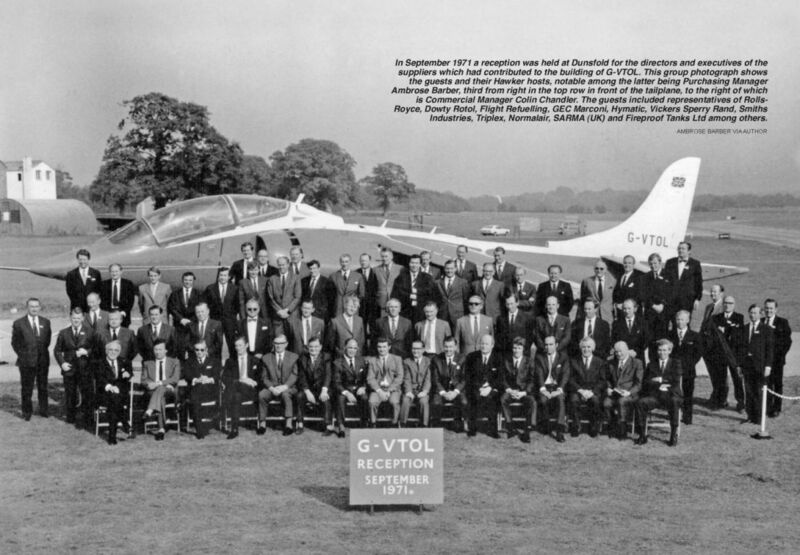 In September 1971 a reception was held at Dunsfold for the directors and executives of the suppliers which had contributed to the building of G-VTOL. This group photograph shows the guests and their Hawker hosts, notable among the latter being Purchasing Manager Ambrose Barber, third from right in the top row in front of the tailplane, to the right of which is Commercial Manager Colin Chandler. The guests included representatives of Rolls-Royce, Dowty Rotol, Flight Refuelling, GEC Marconi, Hymatic, Vickers Sperry Rand, Smiths Industries, Triplex, Normalair, SARMA (UK) and Fireproof Tanks Ltd among others. Bedford-based Harrier T2 XW175, another of the four Harriers used in the trials. Flown by John Farley, Hawker Siddeley's Harrier T.52A demonstrator, G- VTOL, used smoke to show what happens to the efflux from the Pegasus engine when thrust is vectored. SPANISH HARRIERS - Last November the Spanish Navy's helicopter-carrier Dedalo sailed to the U.S.A. to collect her new fixed-wing aircraft complement of Hawker Siddeley Matadors (Spanish name for the Harrier). She returned the same month carrying five AV-8A Matadors and two TAV-8A two-seaters and has since been reclassified as an aircraft-carrier. 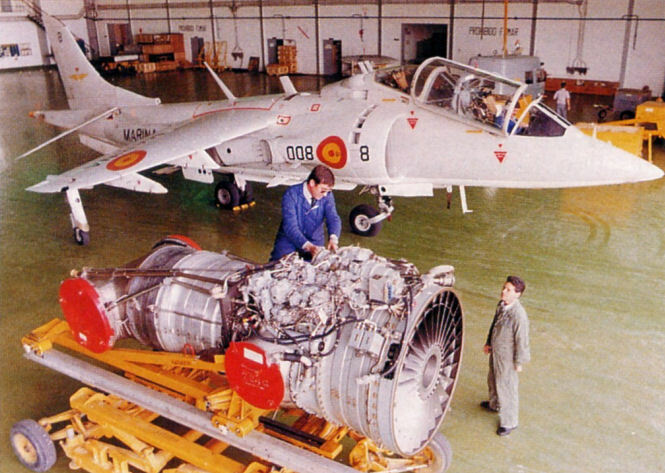 The Matadors now equip the 8a Escuadrilla, whose shore base is Rota, Cadiz, where these photos were taken by Javier Taibo - AV-8A "3" and TAV-8A "8" (photo). Crunch! Groundcrew take precautionary measures after G-VTOL comes to grief during a demonstration in Abu Dhabi on July 16, 1972. 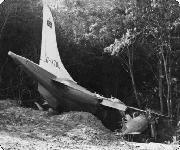 Damage was confined to the starboard wingtip and outrigger, the noseleg and a twisted nose. 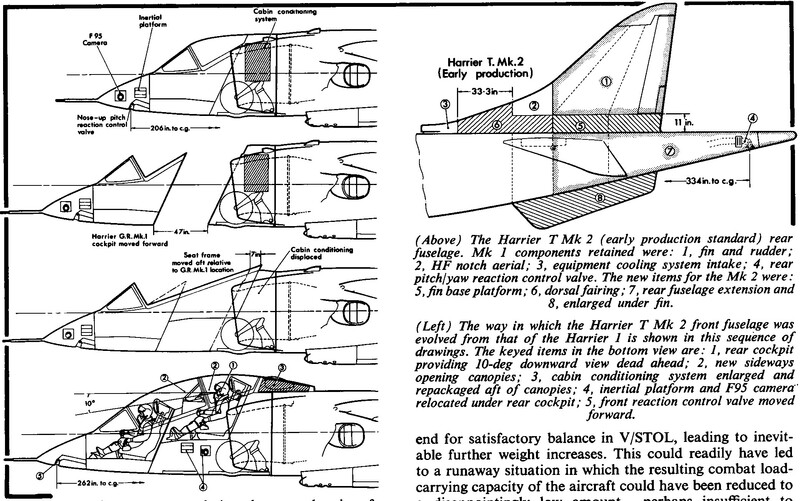 The way in which the Harrier T Mk 2 front fuselage was evolved from that of the Harrier 1. 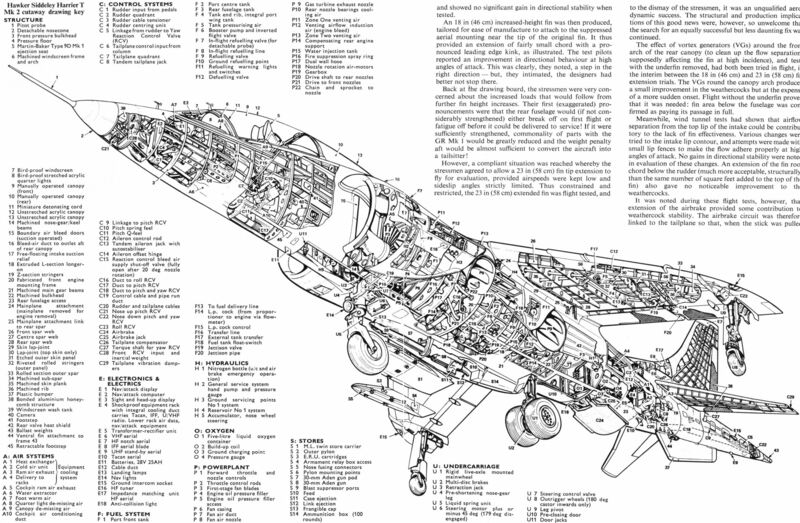 The Harrier T Mk 2 (early production standard) rear fuselage. 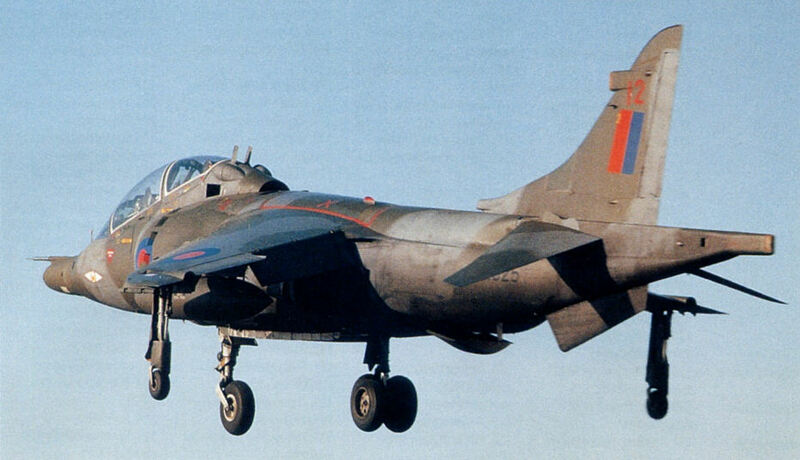 The production Harrier T Mk 2 with gun pods, bombs, drop tanks and rocket pods.